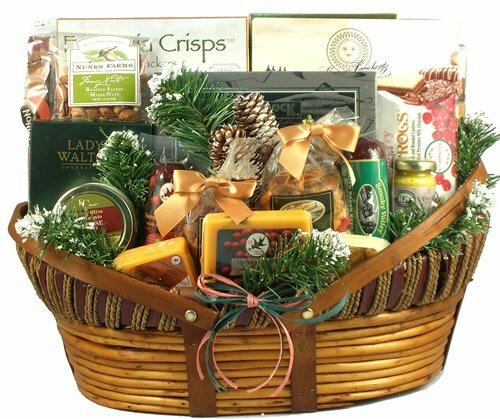 Who wouldn't love this wonderful holiday gift basket filled with an all-time favorite holiday combination, Wisconsin cheeses, sausage, crackers, nuts and more! this family of cheese and sausage gift baskets have been a best seller year after year. This Larger version of our best selling holiday basket is impressive to say the least. We have filled this very handsome and unique wooden basket with: The xl version of this very popular gift basket includes: gourmet focaccia crisp crackers cranberry cheddar gourmet cheese Wisconsin Swiss cheese Wisconsin cheddar cheese a jar of delicious green olive and pimento cheese dip jumbo cashews and peanuts "nick Nays" cocktail mix assorted dipping mustard beef salami all beef summer sausage with cranberries (delicious!) mint chocolate wafer cookies cranberry bog frogs (sweetened dried cranberries and cashews smothered w/ caramel and chocolate) bourbon vanilla dessert twists chocolate salted caramel cookies deliciously moist chocolate rum cake dipping pretzels onion blossom horseradish dip pepper cheese classic flavored Tortuga Cayman island rum cake holiday cookies assorted German chocolate dipped cookies gourmet almond caramel popcorn dark chocolate covered cranberries and almonds olive oil and sea salt crackers pillow chocolate filled cookies tiramisu cream filled cookies classic vanilla caramels mocha almonds smoked salmon (4oz) mixed nuts chipotle cheddar cheese garden vegetable cheese assorted Biscotti When it's all done, we tastefully decorate it with holiday pine and carefully wrap it with a basket bag and a large bow. Take This extra large meat and cheese holiday gift basket favorite with you or send it when you can't be there in person. This Super sized version of our best selling home for the holidays, has more than enough cheese, sausage and crackers to start any holiday celebration, share with favorite neighbors, or send to out-of-town relatives. This Holiday gift basket has been a gift basket village best seller ever since we introduced it in 2007.